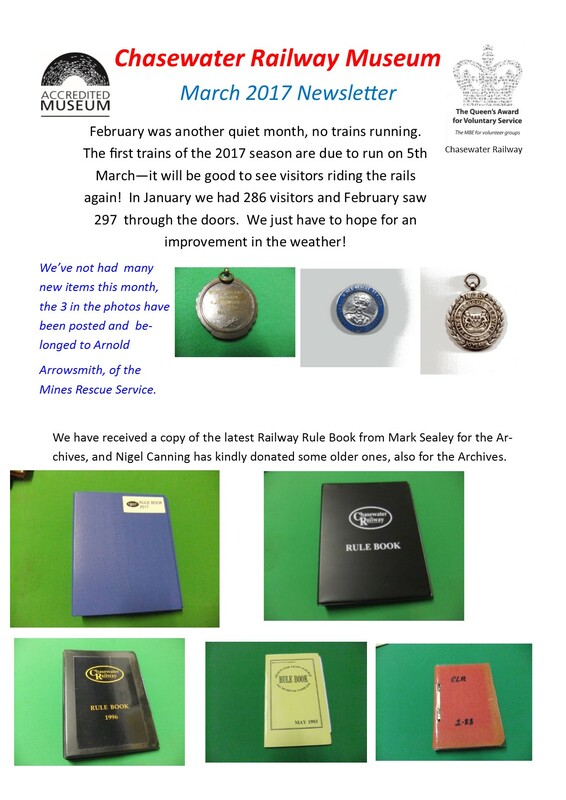 Our latest newsletter and the last one before trains start running. 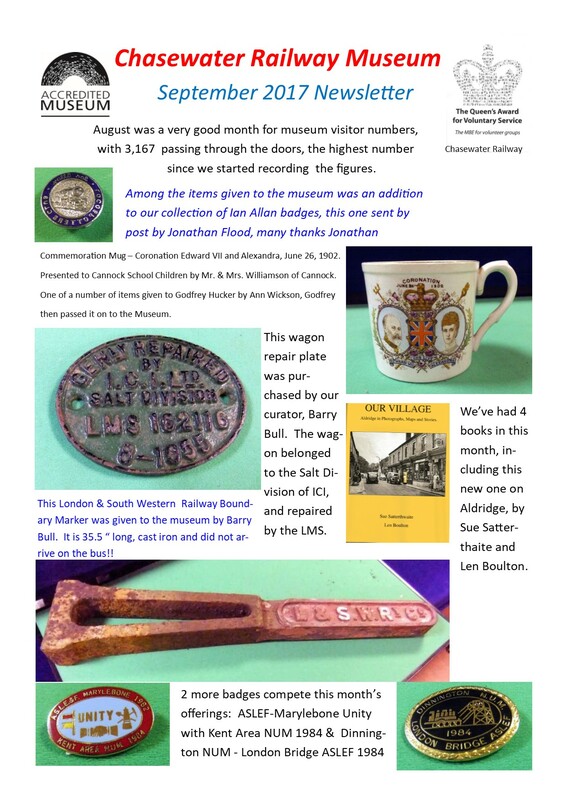 Bi-monthly news sheet of the Midlands Area of the R.P.S. From the Hon. Secretary’s notes and reports. These notes were from the early days when the depot was at Hednesford. News has been rather scarce this time. I have only had articles from the Hon. Treasurer and T. C. Jones, it is difficult to keep making up copy and I do hope that members will co-operate and send in articles. Otherwise the ‘Mercian’ will soon cease to function. Pleas send in articles, no matter how small, copy must be sent in by the 8th May. A new siding has now been completed, the G.E.Brake is now stabled on this siding, this has allowed room for the T.P.O. and the Coal Tank to be moved further under the covered space, giving greater protection from the weather. The whole scheme of the new siding was planned by the Assistant Depot Manager, John Elsley, the installation was very ably carried out by him and his small, but willing band of helpers. New glass has now been fitted in the windows of the G. E. Brake, the toilet of the T.P.O is now in the process of being repainted, whilst the interior of this vehicle has been thoroughly cleaned. David A. Hives, Hon. Sec. The Society holds working parties every Sunday, these commence at 2.30pm. There are however, a number of members who would like to attend working parties, but cannot attend those held on Sundays. During the Summer we are hoping to recommence working parties on Saturdays and Wednesday evenings. Would you please specify on the form below the days you wish to attend, and return form to the Secretary, alternatively contact by post card. This post is taken from the earliest newsletter found so far amongst the ‘Duplicate Magazine ‘ file. I reproduced the first part just to show that our aims haven’t really changed in the last 50 years. What is our eventual aim? It is obvious that we want to run a railway. But what sort of railway is this to be? What picture do we want to give to the general public? We could push together a train, grab a piece of line and say this is a preserved railway. But will it mean anything to the general public? Each district will, inevitably, form its own collection of smaller relics which eventually we hope to show to the public in exchange for money. As a railway enthusiast, a mass of cast iron plates, old faded photographs, tattered maps, dog-eared tickets and general bric-a-brac fascinates me and I can spend hours contemplating such a collection, but I would strongly suspect this would leave the general public with a feeling of mental indigestion and a fixed idea that railway enthusiasts are really mad. Any preserved railway depends on the general public for the main part of its traffic. We must study their interests and make sure that we attract them back and their friends to which they have passed a recommendation. It must not be an overcrowded museum, but a ‘vintage railway’ — a living example of how the railways were run, laid out so the general public can see it tick. The steam engine is to us a balanced collection of boiler, firebox, cylinders, pistons, crossheads, etc. But to the ordinary man-in-the-street it is largely a mystery. Our exhibits must be self-explanatory. We must try to explain why the railways grew into such a complex system of competitive lines with so many odd connections. I am not suggesting that we forget the railway enthusiast. I am asking that we consider the picture we are presenting to the general public. These points are not immediately applicable, but we should give consideration to them and encourage the artists and architects amongst us to sketch out their ideas on this basis. This picture was taken from what is now the footpath round the back of Hednesford Park. The building which the carriage is going into still exists but the walls and frontage have been bricked up. January 11th (1960) was a red letter day for members of the West Midlands District when a 27 ton 1909 Royal Mail coach, purchased by us for £200, rolled into our Hednesford depot. Sold by British Railways the 50 foot bogey coach, complete with letter pigeon holes and half-penny stamp post-box – as good as new – it has joined our other two museum passenger coaches, an 1895 Great Eastern Railway brake vehicle and an 1875 Maryport & Carlisle Railway coach. The mail coach travelled up from Verney, near Wolverton in Buckinghamshire, and celebrated its historic run by charging up the batteries to give full lighting inside. 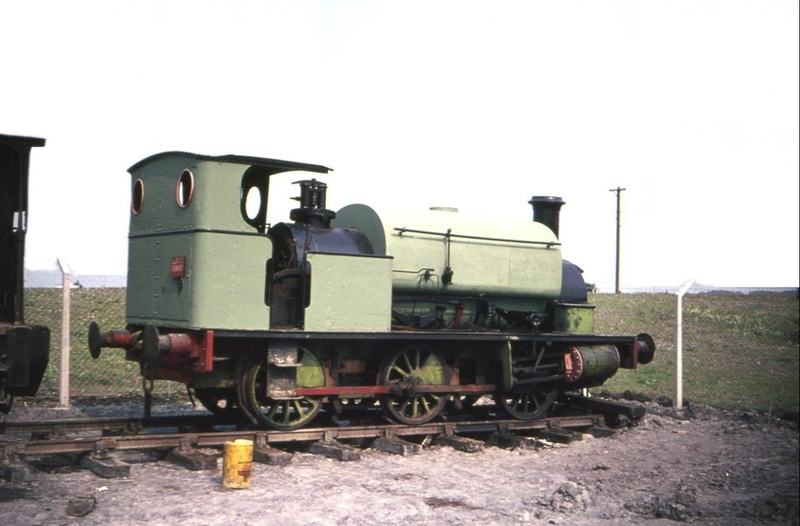 It was shunted into the depot sidings by an NCB tank engine. Unlike the other two vehicles, the T.P.O. is too high to be placed under cover in our vehicle shed, but members are planning to lower the track to enable it to enter. Twenty R.P.S. members were among the passengers to travel on the last train from Macclesfield to Uttoxeter by the Churnet Valley line of the ex-North Staffordshire Railway on November 5th (1960). Some of our members had departed from Macclesfield early in the afternoon in order to break the journey at Oakamoor and again make the acquaintance of the station master, Mr. Lister. Macclesfield was reached early enough for members to have a look round the town before returning to catch the last train. Several relics were noted at Macclesfield (Hibel Road) station, including a NSR/LNWR boundary post. The train left on time at 8.35pm behind Stanier 2-6-4T No. 42670. The coaches were quite full, two of the enthusiastic passengers ringing handbells loudly for most of the journey. A few people had gathered at nearly every station to watch the train depart, and at 9.48pm the train arrived at its final destination, Uttoxeter. It marked the last moments of a regular passenger service on the Churnet Valley line for 110 years. 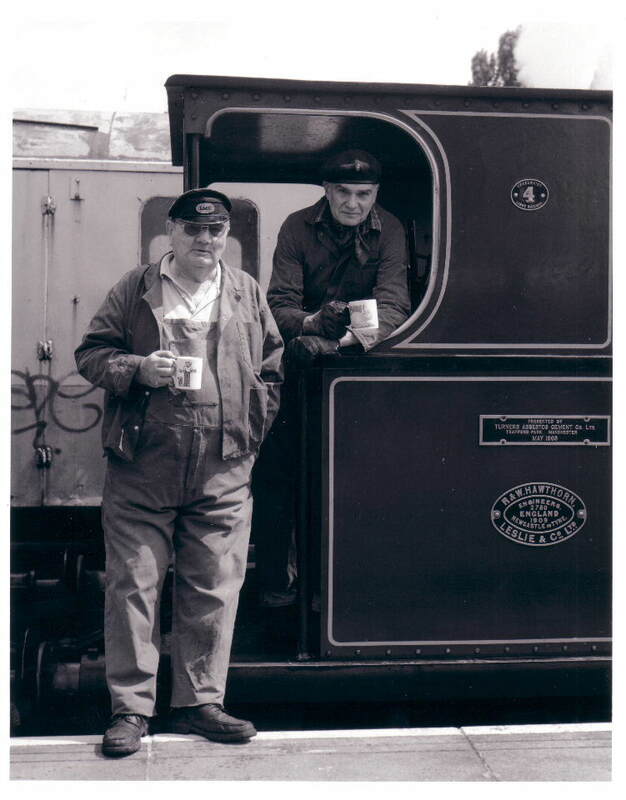 The present Churnet Valley Railway is a volunteer-run organisation. The operating company, the Churnet Valley Railway (1992) plc, is supported by the North Staffordshire Railway Co (1978) Ltd., a Charitable Trust. BBC television news cameras have filmed activities at our Hednesford depot on two occasions in recent weeks. Both items were shown on ‘Midland News’ and have done much to foster interest in the Society. On the occasion of the first visit, members were shown at work on the restoration of the Great Eastern Railway coach. Several of our relics, housed in the coach, were also shown. This was one of three lines under consideration when looking for a permanent home for the railway. On Sunday, October 23rd 1960, a small party consisting of David Ives, James Slater, T. Jones, Frank Harvey and myself visited the Coalport to Hadley line in North Shropshire. Built by the London & North Western Railway, it runs from the very attractive Vale of Severn across high land and through an early centre of the iron and steel industry to a junction on the Wellington to Stafford line. The branch had a terminus at Coalport Station which stands on a long shelf, part cut out and part built up on the steep bank of the Severn. The station buildings comprise a booking office, general and ladies waiting rooms, backing on to the station master’s house. 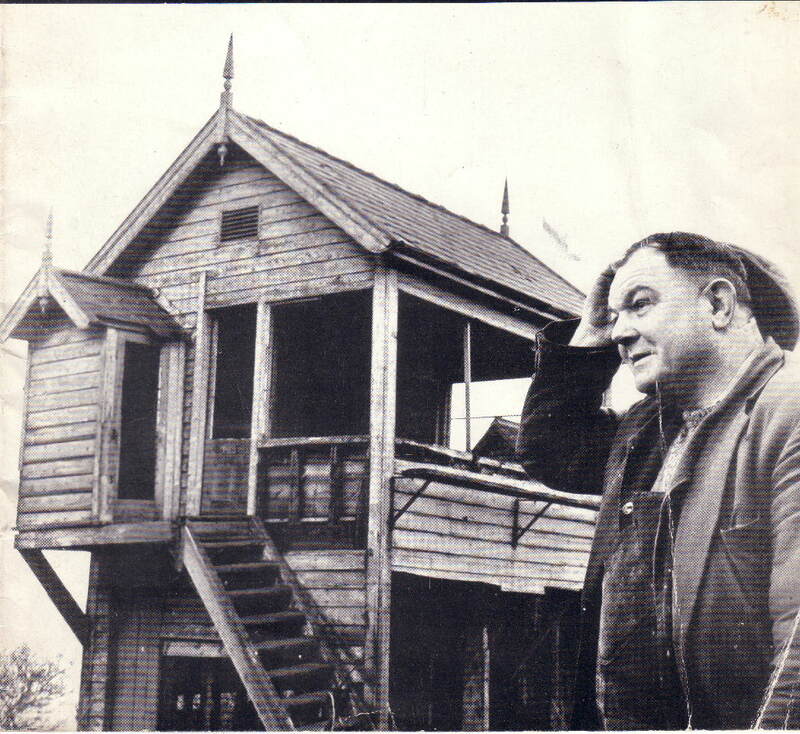 The signal box was demolished and a ground frame installed shortly before services were withdrawn in 1952. 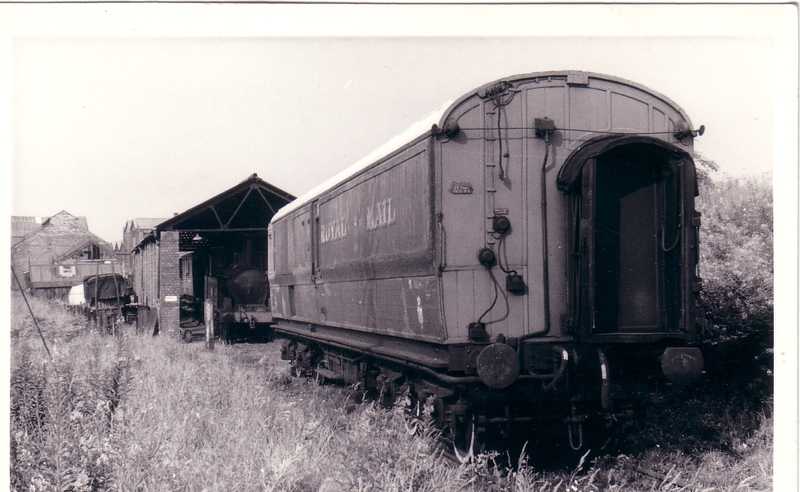 The goods shed has also been demolished, but the three short sidings remain in the yard. Further along the shelf past the station, there is a carriage shed sufficient for four bogie carriages, and an engine shed for two locomotives. These buildings are in fair condition, and the engine shed contains a large workshop space as well as a pit. All these buildings back on to the hillside, and on the opposite side there is a pleasant stretch of wooded land before it falls steeply away to the river which forms the boundary of the railway property. The line rises steeply from Coalport Station with attractive views across and up the Severn Valley before it turns away to cross pleasant rolling countryside to the small town of Madeley. Here the station building is used as an office by an engineering firm, but the yard of some half dozen sidings is practically disused. The line then continues to Dawley and Stirchley Station where a total of some 15 wagons of coal showed that an active coal merchant used the yard. As dusk was falling, the tour of inspection finished at this point. All the members of the party were impressed by the potentialities of the line for day trippers. Before we left the area, we were fortunate to meet a resident interested in the line who presented the R.P.S. with smaller relics. These included an LMS inkwell, labels and official books. We were very pleased to receive these on behalf of the W.M.D.’s collection of local relics. Another couple of bits and pieces from the Railway Forum – Winter 1965. 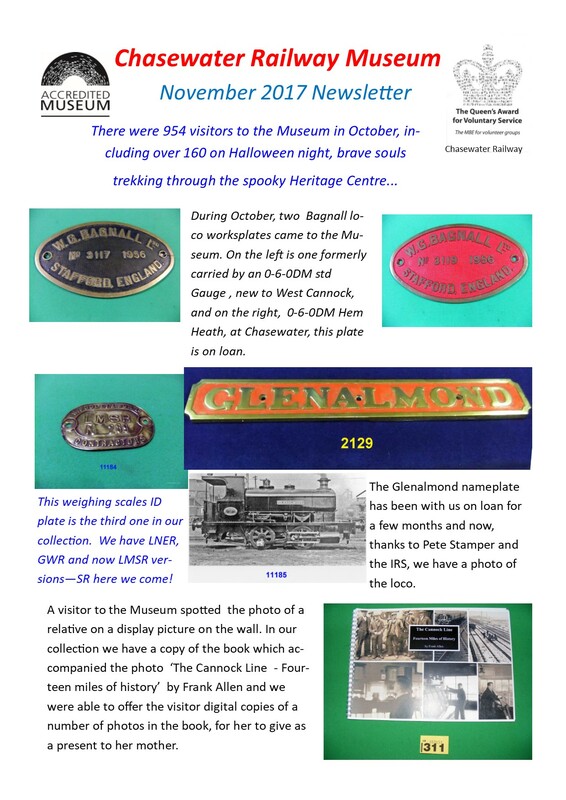 The first is a display of name and number plates, loaned by one of the members, and laid out in the Royal Saloon – which left Hednesford in 1970 for the British Railways carriage works at Derby for restoration and then on to the Midland Railway Centre at Butterley. 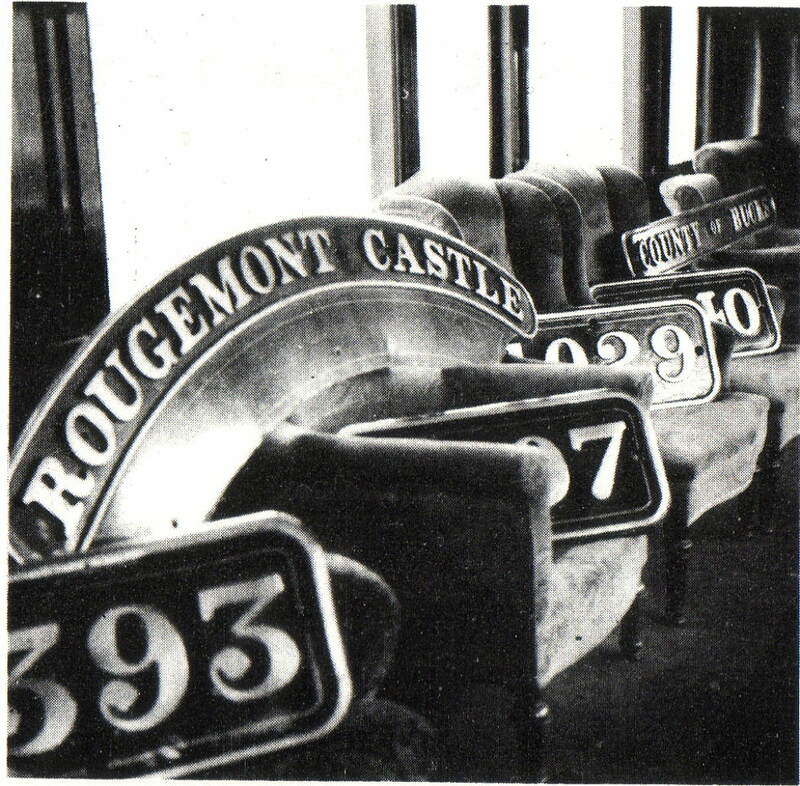 An interesting display of locomotive nameplates and numbers was arranged in the Royal Saloon for inspection by visitors at the Midlands R.P.S. Open Day. Members of the Midlands area, R.P.S. expect to take delivery of another locomotive later this year which has been acquired through the generosity of one of their members, Dr. P.G. Plummer, who has offered to purchase it for them. The locomotive is a Hudswell-Clarke 0-6-0ST built for the Sheepbridge Coal and Iron Company in 1895 (Works No. 431). It was transferred to its present location, Desborough Warren Quarry, Northamptonshire, in March 1951 and was due for withdrawal in July. It is believed to be the oldest Hudswell-Clarke locomotive still in working order and once carried the number 15. Now it has no number or name, although known as “Sheepbridge No.25”. 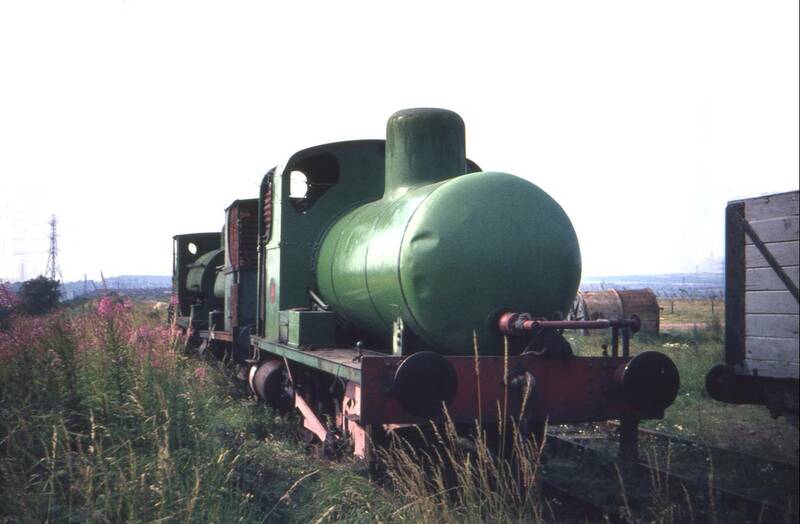 Painted in apple green it should be a valuable addition to stock already acquired, and will be of considerable use at the Chasewater branch line which has been leased by this group. 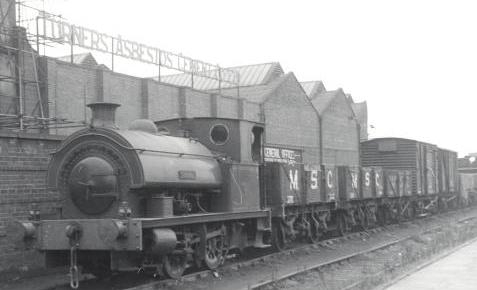 Two other locomotives have also been donated by the Whitecross Co. of Warrington. 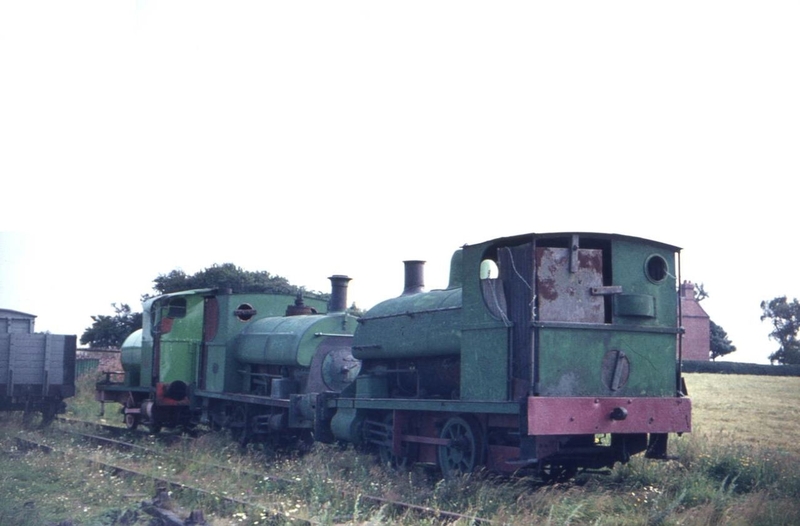 They are Peckett 0-4-0STs of 1900 and 1904 vintage. 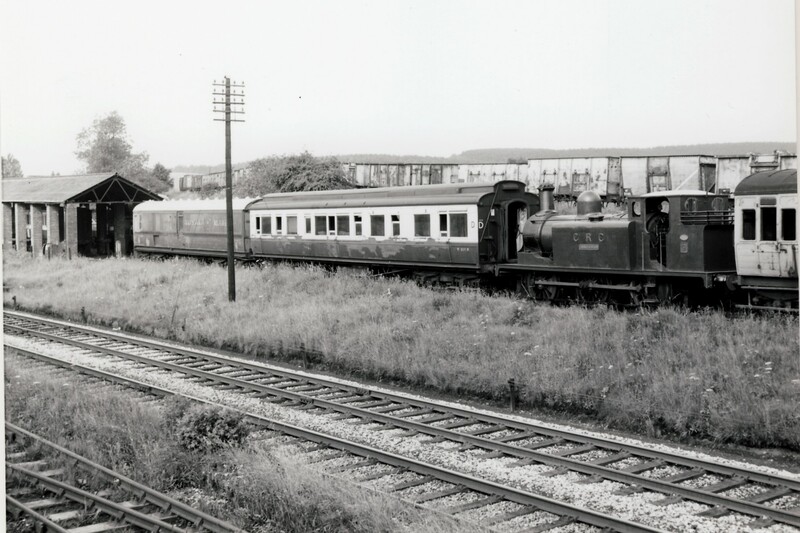 They were withdrawn from service by the Company in 1961, being replaced by two Fowler diesel locomotives. They carried names up to withdrawal, the older being “Baden Powell” and the younger “Lancet” the nameplates of the latter being transferred to the Diesel No.1, and those of the former being acquired by local enthusiasts. Only “Lancet” will be able to run again. It is hoped to exhibit “Baden Powell” statically. The second is about new locomotives coming to Chasewater. Sadly the Hudswell Clarke, although we still have the loco, has never steamed here. The two Pecketts fared even worse. The ‘Lance’ (not Lancet) 1038/1906 was scrapped in March 1972, and another Peckett – 1823/1931 was also scrapped at the same time. The Loco ‘Baden Powell’ was in too bad a condition to be moved. 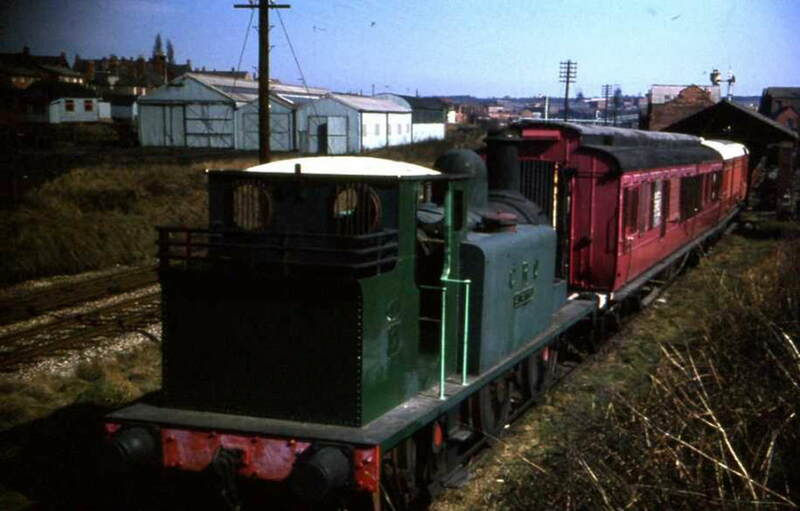 The other loco was an 0-4-0F a fireless Andrew Barclay locomotive 1562/1917 – scrapped in March 1973. 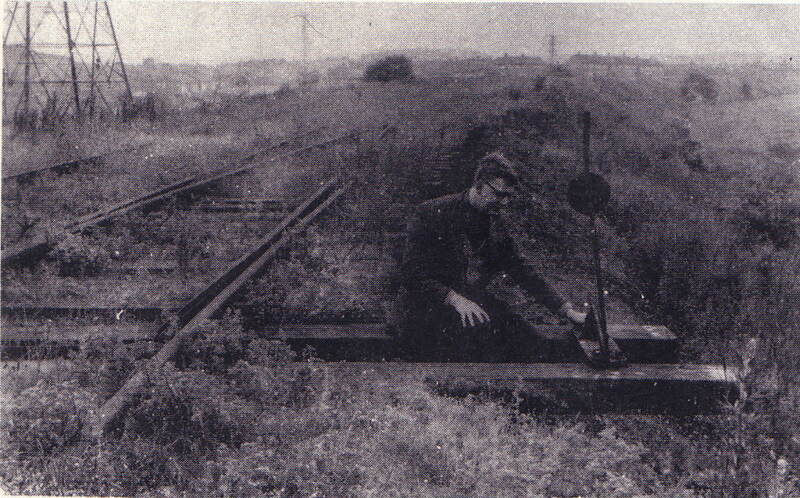 This post was taken from the magazine of the Railway Preservation Societies – the ‘Railway Forum’ Winter 1965. This picture was taken from the cover of the magazine. I’m not sure where this photo was taken, but assuming it’s on ‘our’ line it might be between Norton East Road and Brownhills Road, judging by the position of the houses. Any other suggestions will be gratefully received! This, and the other track photos in this post were obviously taken before Chasewater trains were running. Chasewater was constructed by the Wyrley & Essington Canal Company by building a low dam. A reservoir 1¼ miles in length was thus formed for the purpose of feeding the nearby canals. 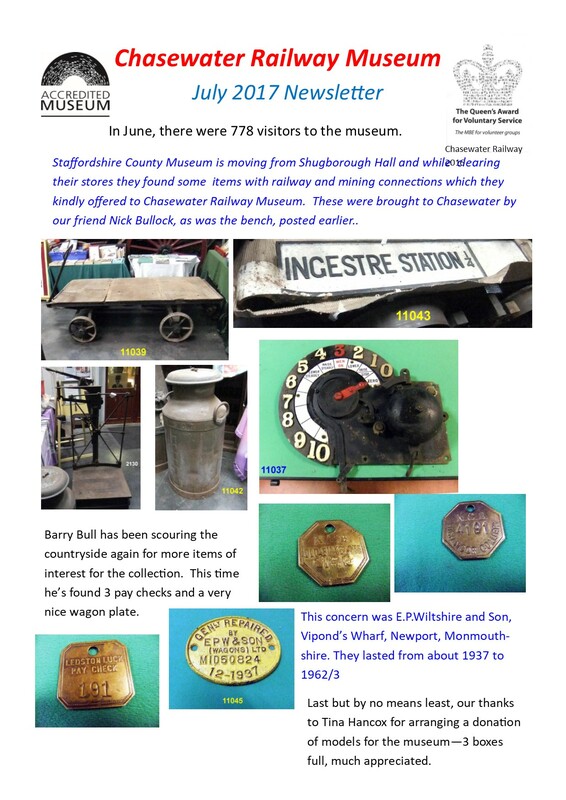 At one time Chasewater was encircled by railways; the earliest of these was the Cannock Chase & Wolverhampton Railway incorporated by an Act of Parliament on July 29th 1864. A connecting link was constructed from the London & North Western Railway Cannock Chase mineral extension which was incorporated in 1862. In 1884 a branch was built by the Midland Railway from Aldridge. This was for mineral traffic, although passengers were conveyed as far as Brownhills. The passenger service was withdrawn on March 29th 1930. 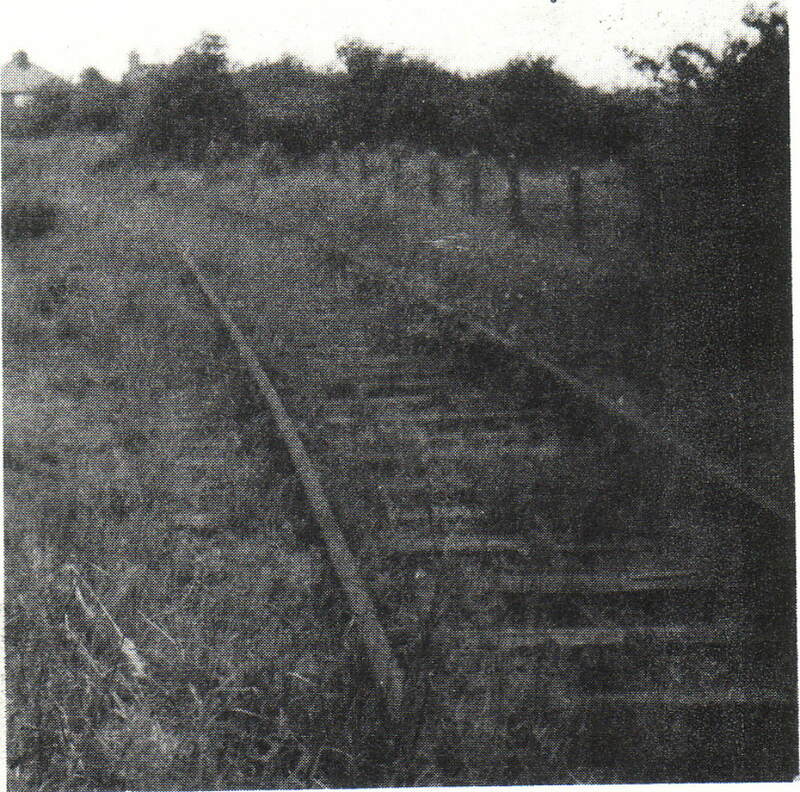 The direct link with the LNWR was broken in favour of a more circuitous connection via the Conduit Colliery Company’s yard. 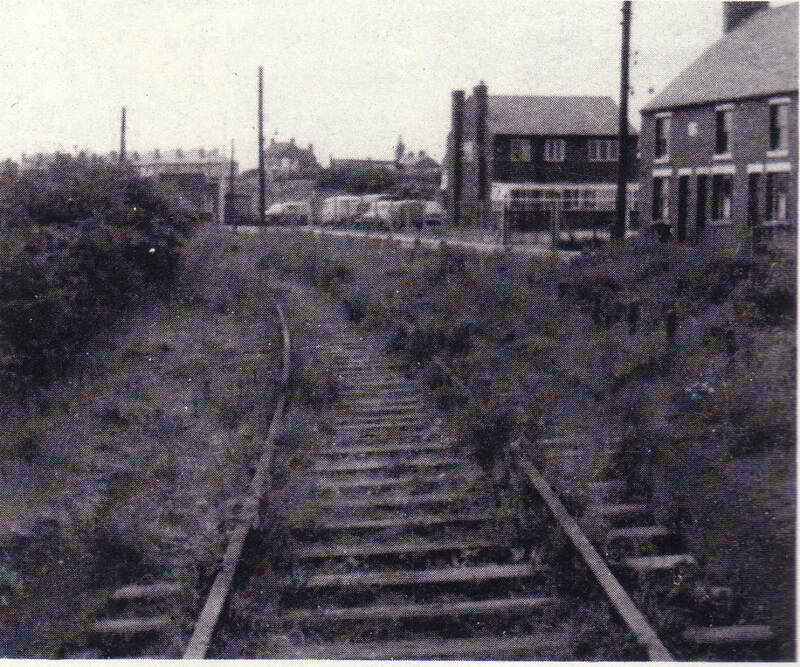 With the closure of the Cannock Chase collieries, the Midland Railway branch from Walsall Wood to Brownhills was lifted in 1960, followed by the CC & WR track in 1963, leaving the remainder of the lines as they are today. These were retained in order to connect the National Coal Board area workshops with the main line. In recent years the possibilities of Chasewater as a pleasure resort were realised by Brownhills Urban District Council; an amusement park was constructed and facilities were provided for more specialised interests such as go-carts, speedboats, hydroplanes and yachts. 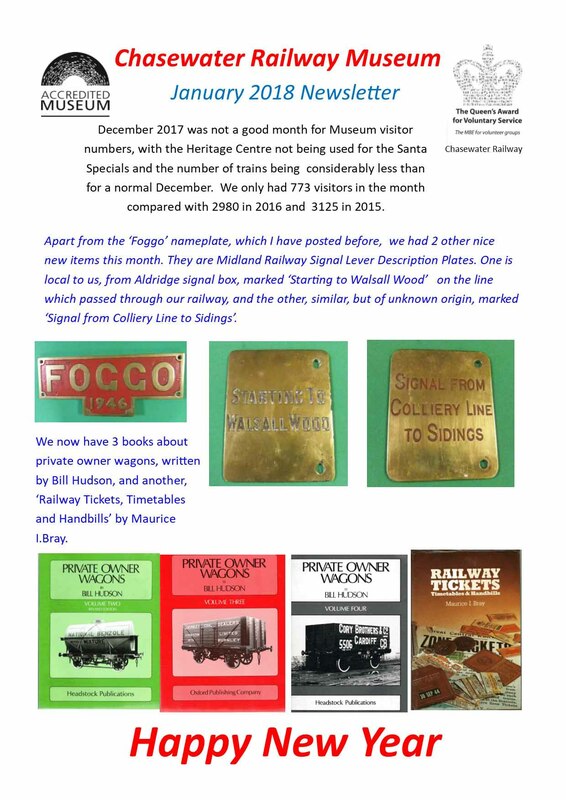 With the increase in visitors each year it was felt by the Midlands area of the Railway Preservation Society that the line would be suitable for development as a working railway museum and a lease of about two miles of track was taken out. Much work has to be done to bring the line up to passenger carrying standards and it will probably be several years before a regular passenger service can be maintained. This largely depends on the number of volunteers that are prepared to help with the track restoration. The immediate aim of the Society is to construct a building to house the larger items of rolling stock where they can be fully restored and displayed to the public. This building will form the permanent headquarters of the Chasewater Railway. The Society would appreciate any help, practical or otherwise, from people interested in this project. With sufficient support a limited service could be in operation by next summer. We know where this one was taken – you can see the entrance to the farm gate. The houses at the top were demolished to make way for the M6 Toll.